Anne Büscher’s work operates on the cutting edge of research, material, craft, and form. For years, she has experimented with various applications of materials. Recurring, core subjects of her artistic practice are the value of ‘findings’, heterogeneity and imitations. Her work has a definite fragility and is characterized by a strong focus on the making process. Drawing on research into how material functions in Japanese ceremony, Büscher’s work focuses on the relationship between material and ritual. Her recent work moon viewing, revolves around the tactile aspects of photography, in which the outcome is not determined by the camera, but by experiments with material, forms and a light sensitive medium. 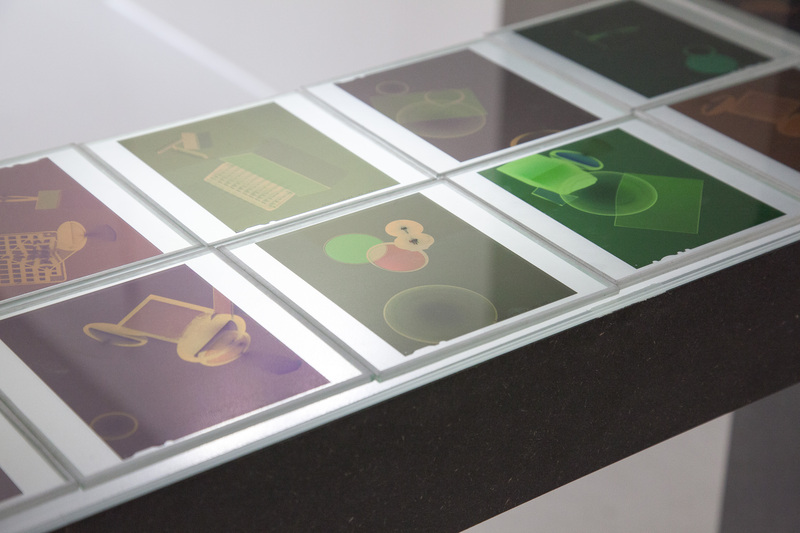 In total darkness, Büscher makes configurations of found glass objects on photographic paper by leaning and balancing them on each other depending on her sense of touch. The photograms show marks of the glass pieces and capture different colors through the refraction of light.